The Bluetooth Powerbeam Pro pairs like any other Bluetooth device. It is compatible with our desktop and mobile applications. Here's how to pair Powerbeam Pro via Bluetooth. Ensure that Bluetooth is On by checking the upper right hand corner If Bluetooth is not on, you may need some additional hardware for your particular device. To learn more about Bluetooth compatibility, see Bluetooth Troubleshooting article in our Help Center. If the Bluetooth is on and the trainer is in range, you should see the PowerBeam profile appear in the Devices Tab. Simply click the Tab that represents the Powerbeam Pro and it will turn green, signifying that it has paired properly. The ANT+ PowerBeam Pro is a little bit trickier to pair due to the proprietary nature of the ANT+ protocol they use. Due to this, the PowerBeam Pro is only compatible with the Windows Application and the Legacy Application (Mac and Windows). We are unable to pair the ANT+ PowerBeam Pro with the Mobile Apps at this time. Once you do this, the PowerBeam Pro should show up Green in your Devices Tab, signifying that it has successfully paired. Visit our Device Pairing Troubleshooting page. Visit our ANT+ USB Stick troubleshooting page. Scroll down to the bottom of this article to view instructions on connecting to the Legacy App. 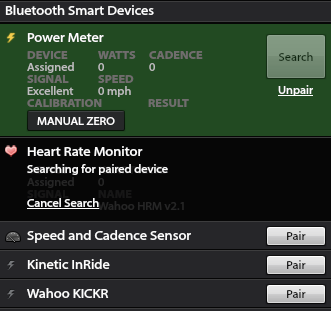 Note that the PowerBeam Pro Smart or BT 4.0 is not currently supported by TrainerRoad. For now, we suggest that you pair the Power BeamPro Smart or BT 4.0 as a power meter shown below. Email support at support@trainerroad.com, and someone will get back to you right away. Here's how to pair Powerbeam Pro via the Legacy app. Open the TrainerRoad Legacy app. You will want to make sure to download the latest version of Adobe Air before you start the download. You should only download this version if you are using a PowerBeam Pro, all other users should download our latest version of the app on our Downloads Page. Plug in your ANT+ USB stick. Go to the Devices tab. If your screen looks like the one below after clicking the "Devices" tab, click "Search for ANT+ USB". If you don't see this button, then good news! TrainerRoad already found your ANT+ USB stick. After your ANT+ USB stick is connected, you should see this screen. Scroll down to where you see the PowerBeam Pro listed, and click "Pair." If you have an older Power Beam Pro, clicking "Pair" may not be successful. If this is the case, you can connect with TrainerRoad by clicking "Legacy" instead of "Pair." The PowerBeam Pro works best when it's paired first — before any other devices. It won't pair if you're trying to pair other devices such as heart rate monitors at the same time. Once the device is paired, it's time to do a Spindown Calibration. A Spindown Calibration aims to quantify the variable of rolling resistance (affected by tire pressure and trainer pressure) in order to get more accurate power readings. This should be done often, not just on the initial setup. Doing it every other ride, or even every ride, isn't a bad idea. After pairing the device, look for the "Spindown" button below the mode selection button. As indicated in the window below, maintain a speed between 18-22mph for 120 seconds. After maintaining the speed for the indicated time, stop pedaling and let your bike coast to a stop. Once your bike has coasted to a stop, you should see the following message. Click "Done" and you're ready to ride!